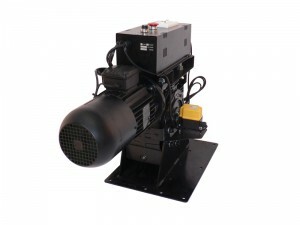 The STS434 is a heavy duty pile winch, which is sometimes known as a pile up winch or a yoyo hoist. This is because the lifting cable “piles” up on itself as the hoist lifts its load. While pile winches are robust and efficient for lifting things like lighting bars, stage truss and other heavy stage aparatus, they also have their limitations. Because the cable winds up on itself, the diameter of the drum constantly changes so the load will not move at constant speed. Also, because the lifting cable is winding up on itself there is slightly more wear and tear on the cable. Also available as STS434-DS500 double drum unit with up to 12 cables (3 phase power requirement).